Galen Section;1.7 miles stone-dust & gravel. 2.4 miles hard packed grass towpath. Difficulty: Easy. Flat stone-dust or paved surface. To start from Camillus; From I-690 take exit 6 to Route 695 south. Keep right to merge with Route 5 west. Take your first exit to Route 173/Warners Rd and turn left. Travel 1.2 miles to a parking lot on your right across from the canal. To start from Weedsport or Port Byron; From I-90 take exit 40 to Route 34 south (right) to Weedsport. Turn right on Route 31 and as you leave town look left for the Centreport Aqueduct Park parking lot. Continue along Route 31 towards Port Byron. Just as your approaching Port Byron look left for the Schafer Park parking lot. To start from Galen; From I-90 take exit 42 to Route 14 north for 7.5 miles. Turn right on Route 31 and travel 2.6 miles. Turn right on Peters Rd and travel 0.4 miles to Lock Berlin Park parking area. To start from Newark; From the junction of Routes 31 and 88 in Newark head north across the canal on Route 88. turn right on Van Buren St for the T Spencer Knight Canal Port parking lot. To start from Palmyra; From the junction of Routes 21 and 31 in Palmyra travel west on Route 31. Turn right on Market St, which becomes Division St and follow to the Erie Canal Marina parking lot. To start from Genesee Valley Park; South (Rochester); From I-390 take exit 16 (westbound) or 16A (eastbound) to East River Rd heading west. Travel through the traffic circle and take your first right into Genesee Valley Park; South. Keep right at the first two intersections. Cross a bridge over a river and park underneath the highway. Follow the trail left then right to a concrete pedestrian bridge over the canal. This brings you to Genesee Valley Park; North and the Erie Canalway Trail. Right takes you along the Erie Canalway Trail; Syracuse-Rochester. Head straight along the Erie Canalway Trail; Rochester-Buffalo to an intersection next to another pedestrian bridge. The Erie Canalway Trail; Rochester-Buffalo continues left on the bridge over the Genesee River. Straight takes you along the Genesee Riverway Trail; West Side. Cross the Genesee Valley Park; West-North Bridge over the Genesee River to Genesee Valley Park; West. This brings you to the Genesee Riverway Trail; West Side and Erie Canalway Trail; Rochester-Buffalo junction. These sections of the Erie Canalway Trail travel from Syracuse to Rochester. A gap currently exists between DeWitt (east of Syracuse) and Camillus (west of Syracuse). Another gap exists from Port Byron to Clyde. Between Clyde and Lyons some sections have been completed, or at least are ridable. The trail then continues west from Lyons to Rochester. The Erie Canalway Trail is a network of approximately 300 miles of multiple-use trails across upstate New York. The trail follows the towpaths of both active and historic sections of the New York State Canal System, such as the Erie Canal and Old Erie Canal, as well as, adjacent abandoned rail corridors such as the former West Shore Railroad which was chartered December 5, 1885 , as successor to the New York, West Shore & Buffalo Railway. Called in its day "the eighth wonder of the world," the Erie Canal remains one of America's best known and enduring icons. A marvel of nineteenth-century engineering, the canal, begun in 1817, followed a path already popular to westward-moving Americans, following the Mohawk River through the Appalachian Mountains and then on to Lake Erie. Building the canal was a tremendous feat. Workers had to dig a 363-mile ditch that was 40 feet wide and four feet deep, through rocky hills and swamps and across rivers. What's more, this ditch had to slowly rise 565 feet on its way from the Hudson River to Lake Erie, which it did through a series of locks. Derided as "Clinton's Ditch," after New York Governor DeWitt Clinton, within months of the canal's opening in 1825 the doubters were proven wrong by the canal's overwhelming success. The canal gave rise to additional connecting canals, including the Oswego, Cayuga-Seneca, and Champlain, the last of which actually opened before the Erie Canal. For more information visit; CANALWAY TRAIL or NY CANALWAY SYSTEM . The Erie Canalway Trail is part of the Empire State Trail , which will be a continuous 750-mile route spanning the state from New York City to Canada and Buffalo to Albany, creating the longest multi-use state trail in the nation. Note; A shuttle system has been set up along the length of the Canalway Trail. Visit: BIKE TOURS/SHUTTLE . Starting from Camillus; The wide stone-dust Erie Canalway Trail travels west along the northern side of the canal. Note; A grass lined trail travels along the southern side of the canal as part of the Nancy Browne Wildlife Sanctuary. After passing by an informational sign saying this was the site of the old Erie Canal Clintons Ditch Aqueduct and Lock (A path to your right takes you to Nine Mile Creek) you'll come to the Nine Mile Creek Aqueduct where the canal crosses over the creek. More informational boards. Pass by some old canal boats and canal relics, as well as, the Camillus Sim's Store Museum before coming to Devoe Rd at 2 miles. Across the canal is the Camillus Feeder Canal (bridge over it) followed by Camillus Landing. Map board, picnic pavilion, Porto-Potty's and Devoe Road parking lot located here. Note; If you head left over the canal on Devoe Rd you'll come to a Steam Engine Exhibit on your right. To the left is where the grass lined trail ends along the southern side of the canal. The wide stone-dust trail continues west. This was as far as I traveled. Cross Route 36 at 4.2 miles where you'll find a parking lot and picnic pavilion. Cross Route 66 at 6.7 miles in Memphis where you'll find a parking lot. Cross Route 135 at 8.3 miles, followed by S McDonald Rd. You'll share the trail with a residential road for a bit before coming to Schaap Rd at 10 miles. Come to N Beaver St at 11.5 miles where you'll need to turn right then left for a short on-road section along N Chappell St. Just past the Jordan Middle School you'll rejoin the stone-dust trail in Jordan at 11.7 miles. I've checked out this section. A bridge takes you over Skaneateles Creek. Here the remains of the Jordan Aqueduct (Enlarged Canal 1840-1845) carried the Old Erie Canal over this creek. In 1932 a garden park was created and is still going strong. Down below is the "Kissing Bridge" which was moved here. Lots of informational boards. Cross Main St, past a Veterans Memorial and travel along the grass lined canal, which allows you to see the stonework that would normally be hidden under water. Cross Hamilton St and Warner Rd before coming to Route 31 where you bear left to a crosswalk (Use Caution; High speed road). The trail now travels along a wooded corridor. Come to the remains of Lock 51 (1847) at 13 miles. Here you'll find the Route 31 parking lot, informational board and picnic tables. Here you can walk through the old grass lined Locks. The trail continues, crossing Pump Rd and Route 14, before crossing Route 31 (Use Caution; High speed road). Return to Route 31 at 14.9 miles. Note; Left is the West Shore Trail, a grass surface trail that travels up a slight hill bringing you to E Brutus St after 1.7 miles. I didn't check out this trail. Future plans call for the West Shore Trail to continue west through Weedsport. Cross Route 31 and after 15.7 miles the trail ends on Towpath Rd where you must continue on-road for 2.1 miles. Continue left (west) along Towpath Rd (low traffic) back out to Route 31 at 16.3 miles. Head right on-road (wide shoulder) crossing Putnam Brook. Come to the busy intersection of Routes 31 and 34 in Weedsport. Continue straight across the intersection (Use Caution) along Route 31. Here you'll follow a Bike Lane for a bit, then a wide shoulder before coming to the Centreport Aqueduct Park parking lot at 17.8 miles. Here you'll find informational boards, map and picnic tables. The stone-dust trail continues west along the grass lined Old Erie Canal before a bridge takes you over Cold Spring Brook next to the remains of the old Centreport Aqueduct. The trail enters a wooded corridor and follows the remains of the old canal. Cross Centreport Rd and the old canal becomes more distinct, filling with water before coming to the Schafer Park parking lot in Port Byron at 20.2 miles, where you'll find a picnic pavilion, map & informational board and Porto-Potty. Note; As of August, 2017 a gap currently exists from Port Byron west to Clyde. Starting from Clyde Riverfront Park; A parking area is next to the boat launch just off Water St. Heading west along the stone-dust trail (Not sure if this is part of the official Erie Canalway Trail as the old Erie Canal is located north of the modern canal) along the southern side of the canal you pass by a picnic pavilion, dock and kiosk before traveling underneath the Route 414 Bridge. After passing by some picnic tables the trail turns out to Geneva St after 0.5 miles where it currently ends. Note; In Clyde the old Erie Canal runs north of the modern canal and parallel to Route 31. West of Clyde existing portions of the old canal follow alongside Old Route 31. From the intersection of Routes 31 & Old Route 31 travel west along Old Route 31. Parts of the old canal are now farm fields while the rest is lost in a corridor of trees that parallel the road. After 1.4 miles you'll pick up a hard packed dirt and grass trail on your left (across from a lone house and before the road travels through woodlands. Parking is available at Lock Berlin Park parking area further west. Starting from Old Route 31 in Galen's; A hard packed dirt and gravel trail leads to the tree line where you enter the woods. Pass by an old stone bridge abutment before coming alongside an active RR. After 1 mile the trail turns to stone-dust. Note; Right a path leads to Black Park where you'll find a picnic pavilion and restrooms. Continue through the woods with the old dried up canal along your right. Cross a bridge over Black Brook. Cross Gansz Rd at 1.7 miles. A short hard packed dirt & grass towpath follows the canal to the Lock Berlin Park parking area where you'll find the remains of the old Enlarged Erie Canal Lock 54 (Lock Berlin) at 1.8 miles. Picnic tables located here. If you continue past the lock you'll renter the woods where a grass lined trail continues alongside the old canal which has some water. This was as far as I traveled. Cross Peters Rd after 2.3 miles, Sunderville Rd at 3.4 miles and finally the trail ends at the intersection of Old Route 31 and Hill Rd, just off Route 31 and Clyde Rd, after 4.1 miles. Note; To reach the next section in Lyons you must travel on-road for 1 mile. Continue out to Clyde Rd and head right across Route 31. Caution No Crosswalk. Take your first left onto Montezuma St (low volume traffic) and follow to Route 14 (Geneva St). Head left and you'll come to Water/Elm St and the modern canal after 1 mile. Starting from Lyons; The paved Erie Canalway Trail picks up off of Water St and Geneva St in Lyons. A wide cement path brings you down to the canal then right underneath Geneva St where the trail travels west along a Riverwalk. Lots of informational signs. The trail then follows an access road above the canal before returning you to the paved trail where it travels underneath Leach Rd bringing you to Lock 27 at 0.2 miles. Across the canal is the Canandaigua Outlet for Flint Creek. Heading west alongside the canal you'll come to Abbey Park after 0.6 miles where you'll find a playground, picnic pavilion and restroom. Exit the park for a short 1 mile on-road section left along Old Newark-Lyons Rd (narrow shoulder), crossing over Ganargua Creek. Pass by Dry Dock Rd at 1.4 miles. Note; You can take a quick detour here to check out the old Enlarged Erie Canal Lock 56. Head left down Dry Dock Rd past Lyons Dry Dock and across the canal next to Lock 28A. Continue right alongside the canal. After 0.5 miles, as the road turns away from the canal, bear right on a grass lined path. This takes you past the old Enlarged Erie Canal Lock 56. Travel past the Lock and turn left back out to Dry Dock Rd where you can loop back to Old Newark-Lyons Rd for a 1.4 mile loop. Continuing along Old Newark-Lyons Rd you'll pick up the Canalway Trail on your left at 1.6 miles. Here you'll find a small parking lot and map board. This was as far as I traveled. The wide stone-dust trail continues west alongside the canal before emerging onto Old Lyons Rd at 3.6 miles. Another on-road section. Head left following Old Lyons Rd (wide shoulder) before rejoining the paved Canalway Trail on your left at 5.3 miles. At 5.4 miles you cross N Clinton St. I've checked out this next section. Note; You can take a quick detour here to check out the old Enlarged Erie Canal Lock 58 & 59. Head left down N Clinton St past Lock 28B and across the canal and you'll quickly come to the old Enlarged Erie Canal Lock 59 on your left. The grass lined Lockville Trail takes you past the old Lock then through the woods to the old Enlarged Erie Canal Lock 58. The trail then loops back alongside the canal to N Clinton St.
After crossing N Clinton St you'll come to Lock 28B and another informational board. The trail continues along the canal before exiting back out to Old Lyons Rd at 5.7 miles. Old RR trestle across the canal here. Head left for a short on-road section along Old Lyons Rd (wide shoulder). Cross East Ave and you'll come to the T Spencer Knight Canal Port parking lot at 5.9 miles in Newark. Head left to pick up the cement path that travels through the T Spencer Knight Canal Port (Gazebo and picnic pavilion) to a paving stone dock along the canal. Travel underneath N Main St where you'll rejoin the stone-dust Canalway Trail at 6.1 miles. Travel above the canal through a wooded corridor with a few small hills before you come to an old iron trestle bridge across the canal at 6.6 miles. This bridge has been converted to a pedestrian bridge. Right brings you to the W Shore Blvd parking lot. This was as far as I traveled. The trail continues west along the canal, past the Carter Canal Park parking lot (map board) and underneath Whitbeck Rd at 7.8 miles. Travel along the Wide Waters of the Erie Canal before a tunnel takes you underneath E Palmyra Port Gibson Rd at 9.5 miles. After traveling underneath Galloway Rd at 11.9 miles you come to an intersection at 12.3 miles. Note; Right will bring you to the Swift Landing County Park parking lot. Continue straight across Ganargua Creek via an iron bridge, past a map board overlooking a spillway dam and across another iron bridge over Red Creek to another overlook. Very scenic area. The trail continues along the canal traveling underneath Route 21 at 13.9 before coming to Division St. I've checked out this next section. Here you'll need to cross over the canal via the Division Street Bridge (closed to traffic). This takes you past a small harbor to the Erie Canal Marina parking lot at 14.6 miles. The trail continues right crossing Willow and Church Streets before a berm takes you between the Palmyra Wetlands and Old Erie Canal. You then pass through the Pal-Mac Aqueduct Park where you'll find restrooms and picnic pavilions before traveling underneath the old Whipple Bridge at 15.5 miles. This is one of the oldest known surviving Whipple Bridge structures. You can go up and across this bridge. The trail then travels left where you'll find the remnants of the old Palmyra Macedon Aqueduct, before crossing the Creek Rd next to Route 31. Note; Right along Creek Rd brings you to Lock 29. Continuing along the trail you'll cross over Ganargua Creek and a spillway for the canal before coming to a map board along the Erie Canal at 15.9 miles. This was as far as I traveled. At 16.7 miles the open trail travels between the canal and Route 31before turning right on O'Neil Rd and crossing over the canal where you pick up the trail again at 18 miles. I've checked out this next section. Note; You can take a quick detour from here to check out the old Enlarged Erie Canal Lock 60. Head right past a red gate along a dirt and grass trail along the canal. You'll come to the old Lock after 0.3 miles. After checking out the Lock you may return via a grass lined path that follows the power lines and the Old Erie Canal back out to O'Neil Rd for a 0.7 mile loop. Continuing left along the trail you'll pass by the old stone abutments of Gallops Bridge #39 with an accompanying informational board. Travel underneath Ontario Center Rd and you'll come to Lock 30 at 18.6 miles. Picnic tables and Porto-Potty. Note; You can take a quick detour from here to Macedon Canal Park. Head left crossing Lock 30 to Macedon Canal Park. Head left then right along a service road where you'll travel right through a parking lot past the Fire Dept. and pavilion. This will bring you to the start of the 0.4 mile Butterfly Nature Trail after 0.3 miles. This gravel trail travels past wild flowers and alongside the Old Erie Canal (Clintons Ditch)/Enlarged Erie Canal out to the Erie Canal. Informational sign. Return along the trail then head left out along the Erie Canal before completing the loop. Return back to the Canalway Trail after 1 mile. This was as far as I traveled. The trail continues west alongside the canal. Cross Canandaigua Rd, then Route 206 at 21.8 miles. Parking area here. The trail then shares the road with W Canal St (low traffic gravel road) for 0.5 miles before returning to stone-dust. Travel underneath Route 44 at 24.1 miles and share a road again at 24.5 miles with Cobb's Lane (low traffic paved road). The paved trail then travels alongside Cobb's Lane at 25.1 miles. Come to a pedestrian bridge over the canal at 25.6 miles. Note; This bridge takes you over to the Rochester, Syracuse & Eastern Trail . I've checked out this next section. The paved trail continues west alongside the canal passing by the Cobb's Lane parking lot where you'll find a map board. Travel underneath Turk Hill Rd and past a ramp up to Turk Hill Rd. Pass a spur for the stone-dust Thomas Creekwalk on your right and you'll come to an intersection at 26.1 miles. The Canalway Trail continues straight along the canal, however, all bikes must detour around the next section which is pedestrian only. Follow the paved trail right to a roundabout. Note; This is the start of the Thomas Creekwalk on your right. This trail parallels Thomas Creek with boardwalks and overlooks along your left. Only 0.3 miles long before it brings you back out to the Canalway Trail. Travel left on-road along Liftbridge Lane (Bike Sharrows) through scenic Fairport paralleling the canal. Cross Main St passing by the old Fairport RR Station before rejoining the paved Canalway Trail at 26.5 miles. This was as far as I traveled. The trail then loops south passing by a spur to Perinton Park parking lot at 27.3 miles before traveling underneath Fairport Rd. Pass by the Fairview Crew Club after which the trail reverts to stone-dust at 27.5 miles. Travel underneath Ayrault Rd, Route 31, then I-490 at 30.1 miles. Travel underneath Route 38 where the canal starts looping back north. Travel alongside the Great Embankment Park and you'll come to a small dock and a spur trail leading to the Great Embankment Park parking lot at 31.6 miles. Pass by a Guard Gate before traveling underneath Mitchell Rd at 32.5 miles. The trail becomes paved as you travel underneath Route 31 and come to a bench pavilion at 33 miles. I've checked out this next section. Past the pavilion no bikes allowed along the canal. Follow the Bike Sharrows along Schoen Pl (low traffic). This takes you through the old industrial section of Pittsford and past the old Pittsford Flower Mill, Coal Water Tower and TOWPATH BIKE . Crosswalk over N Main St where you rejoin the paved Canalway Trail at 33.3 miles. Travel underneath a RR trestle and Monroe Ave before coming to an intersection at 33.8 miles. Note; This section is closed M-F (6am-5pm) as it bisects private property. To bypass head right down to Brook Rd, then head left and you'll pick up the paved trail again. Continue straight along the canal, then head right through the complex where you'll rejoin the paved trail next to Brook Rd. The trail then continues left through the woods and back alongside the canal. You come to an intersection at 34.6 miles. Note; The trail on your right is part of the Pittsford Loop Trail which follows the tow path of the Old Erie Canal north up to Lock 62. Continuing west you travel underneath Clover St and come to Lock 32 at 35 miles. Porto-Potty and water fountain here. Next you come to Lock 32 Canal Park where you'll find a parking lot, picnic table and informational board. You then cross a causeway and bridge where the trail continues west. This was as far as I traveled. Travel underneath Route 102 and you come to Lock 33 at 36.3 miles. Lock 33 Canal Parking lot located here. Travel underneath S Winton Rd and past spur trails to Meridian Centre Park before traveling underneath Route 100 and I-390 at 37.9 miles. Again travel underneath I-390 and past a spur trail that leads to Brighton Park and Westfall Rd. Travel under E Henrietta Rd, W Henrietta Rd and Kendrick Rd before you pass by the East Guard Lock where you'll find a map board. I've checked out this next section. Rochester University is along your right. Just past the Guard Lock you'll come to an old RR bridge across the canal at 39.9 miles. Note; This is the start of the Lehigh Valley Trail; North Branch which travels south where it meets up with the Lehigh Valley Trail in Mendon. Travel underneath Moore Rd and through Genesee Valley Park; North. Pass by a spur trail on your left at 40.2 miles. Note; This leads to a concrete pedestrian bridge over the canal to Genesee Valley Park; South. 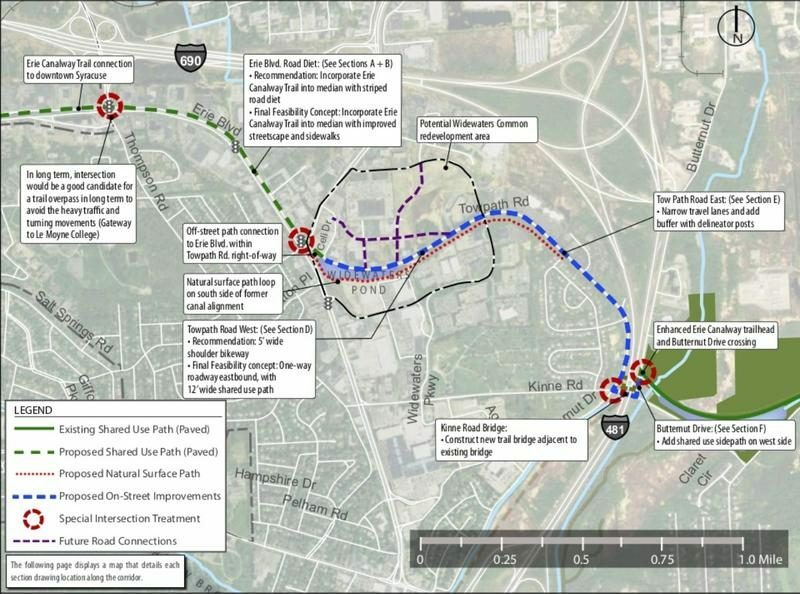 Note; Left leads to a concrete pedestrian bridge over the canal to Genesee Valley Park; South and the Genesee Valley Park; South parking area. Head right to another intersection next to a pedestrian bridge at 40.3 miles. Note; Straight takes you north along the Genesee Riverway Trail; East Side . Head left on the Genesee Valley Park; West-North Bridge over the Genesee River to Genesee Valley Park; West. This brings you to the Genesee Riverway Trail; West Side and Canalway Trail; Rochester-Buffalo junction. Head left as both trails share this section. You quickly come to a junction and map board. This is where the Genesee Valley Greenway begins. All three combined trails then continue left crossing over the Erie Canal via a pedestrian bridge. Look right to spot an old RR bridge. Left to see the confluence of the Erie Canal and Genesee River. You then come to another intersection just below I-390 at 40.7 miles. The Canalway Trail; Rochester-Buffalo continues right. Note; Just below I-390 is another intersection where the Genesee Valley Greenway veers right and the Genesee Riverway Trail continues straight. See; Erie Canalway Trail; Rochester-Buffalo for next section. This was as far as I traveled.